On January 22, 2019 STELIA North America employees generously donated their social committee money to the South Shore Regional Centre for Education’s Breakfast Programs. 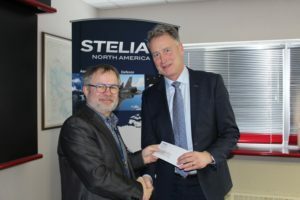 Claude Baril (left) presented SSRCE Director of Programs and Student Services Jeff DeWolfe (right) with the $2,100 cheque. Every dollar counts and we are so grateful for this contribution towards our programs, which run in every school in our region. Thank you to all the staff at STELIA North America in Lunenburg!